I'm always looking out for good dairy free finds when I'm out food shopping. 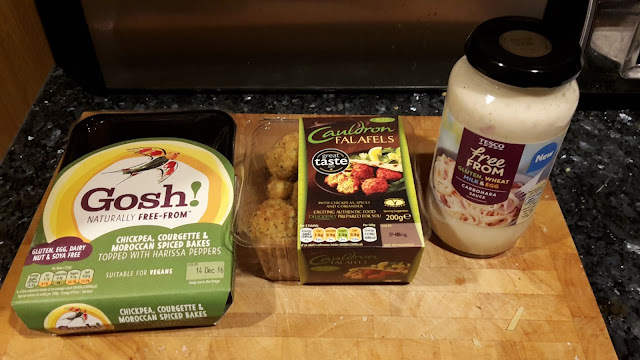 While in Tesco the other week I noticed they had really expanded their Free From range so I picked myself up some goodies. I'm not a vegan but two of the items that i picked up are suitable for vegans. The first being these Gosh! Chickpea, Courgette & Morrocan Spiced Bakes Topped with Harissa Peppers. These are free from gluten, dairy, nuts and soya and they go nice with gravy and vegetables. The second vegan suitable product I picked up were the Cauldron Falafels. I have only tried these once before when a friend cooked a meal with them in and I really enjoyed them! Anything with chickpeas in gets a yes from me. My final find was probably the one that I was most excited about the Tesco Free From Carbonara Sauce. I love a good carbonara and the fact that there is a dairy free option is just that much better! Those are my dairy free finds from Tesco. What're your favourite dairy free products?